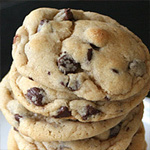 This recipe has been kicking around in my head now for over ten years. 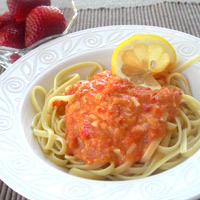 I can still remember thefirst time I roasted a red pepper tosauce up some noodles. It was in my first college apartment, and the recipe called for garlic cloves. Having no clue what that was, I took a trip to the supermarket and came back with my first bulging white head of garlic. Actually, the recipe called for two cloves of garlic, so I came home with two heads. 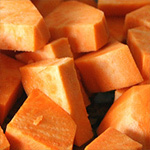 I began pulling apart those garlics, thinking all the while, my this is a strange vegetable! After tediously peeling about eight cloves, I thought, forget the other "clove". Yes, I put eight cloves of garlic in the sauce, mistakenly thinking that the entire head of garlic constituted oneclove... My roommates were very good sports and ate my pasta creation, although we were all pretty sick that night. It took us three days to sweat out that garlic! Ten years and many less notable attempts later, I've developed a much more palatable red pepper sauce that has a bit of a kick. Just don't add thewhole head of garlic. 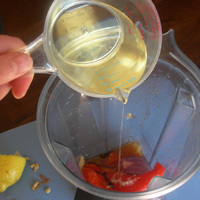 Remove the seeds and the ribs of the Serrano pepper. This is where most of the heat comes from, and for this recipe, we're just looking for flavor, not heat. 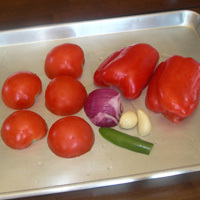 Cut tomatoes in half, remove the seeds from your red pepper, and place on a cookie sheet with onion, garlic, and Serrano. Roast in the oven on 450 for 30 min. While the vegetables roast, prepare your pasta. I used linguine, but anything will work. 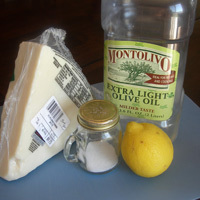 Grate your parmesan or pecorino cheese. Any aged hard cheese will work really well. And the juice from 1/2 a lemon, about 2T Next add 1/2 C of Extra Virgin Olive Oil and blend on low speed, leaving some small pieces in the pesto. Once you have blended the pesto, add the 1/2 C cheese and stir until combined. Preheat oven to 450. 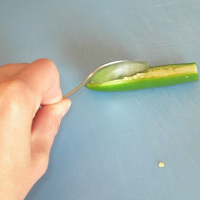 Remove the seeds and the ribs of the Serrano pepper. This is where most of the heat comes from, and for this recipe, we're just looking for flavor, not heat. 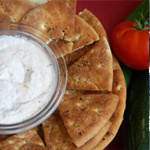 Cut tomatoes in half, remove the seeds from your red pepper, and place on a cookie sheet with onion, garlic, and Serrano. Roast in the oven on 450 for 30 min. While the vegetables roast, prepare your pasta. I used linguine, but anything will work. 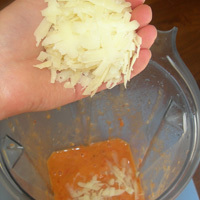 Grate your parmesan or pecorino cheese. Any aged hard cheese will work really well. 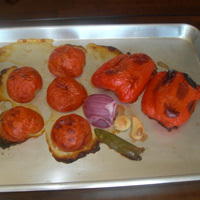 The vegetables are done when the skins are black in places. 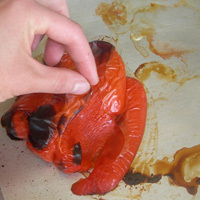 Remove the skin from your red pepper and tomatoes, leaving some of the char marks for flavor. 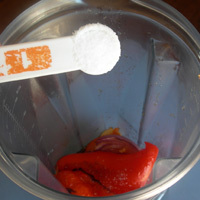 Add all of the vegetables to a blender or a bowl for immersion blending. 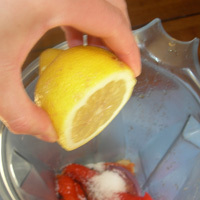 Add 1 t salt, And the juice from 1/2 a lemon, about 2T. Next add 1/2 C of Extra Virgin Olive Oil and blend on low speed, leaving some small pieces in the pesto. Once you have blended the pesto, add the 1/2 C cheese and stir until combined. 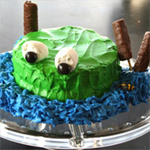 Notes: I prefer using the Serrano pepper for this recipe because it has more flavor; however, jalapeno works well too.